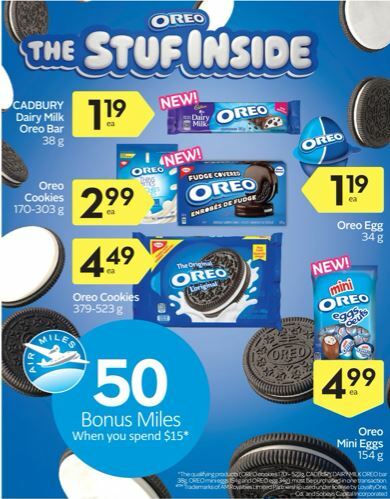 So, you could purchase 13 of the Oreo Dairy Milk Bars at $1.19 each for a total of $15.47 plus taxes, and get 50 bonus Air Miles back worth about $5. This brings the cost of the 13 bars down to $10.47, or 80 cents each, a great price for Dairy Milk bars, and a great opportunity to pick up some chocolate for Easter baskets. Click here to view this offer and other Air Miles offers in the upcoming Sobeys Ontario flyer, valid March the 7th to the 13th.